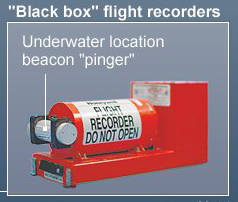 What protects the location beacon (pinger) of a flight data recorder? Is it really a good idea to keep such a vital instrument unprotected? Or is that round metallic thing strong enough to resist impact and fire? The casing of the ULB is itself designed to be strong enough to withstand the forces expected when an airliner crashes into an ocean, lake or large river (which are the only circumstances where a ULB is useful). As voretaq7 notes in a comment: ULBs need to be external to the FDR/CVR canister because they need to have batteries changed regularly without affecting the integrity of the data recorder canister. Not the answer you're looking for? Browse other questions tagged flight-data-recorder or ask your own question. Is there anywhere I can pick up raw flight data recorder information? Who legally owns the Flight Data Recorder? What are the data elements shown on the GE235 flight data recorder (FDR) plot? Which airplanes are required to have a Flight Data Recorder in Europe? Does the Flight Data Recorder store the data locally or send it to an offsite backup while in flight? What is the format of data stored by a Flight Data Recorder? How much data is stored in the flight data recorder per hour in a typical flight of an A380? Is a smart flight data recorder possible?